‘Lazio’, at the first instance, may remind many of us of the football team of Rome. Ofcourse it is really famous! At the same time, what is famous is the historical era from which it has got its name - the region in Central Italy, Lazio whose capital was Rome since ages! The Etruscans were actually the original inhabitants of this region between 8th and 3rd century BC before being driven out by the Romans who conquered the lands. The wine history in Europe pretty much got started from this region by Etruscans where some of the most common cultivars were that of ‘Malvasia’. Lazio has been fortunate in producing a few astonishingly high quality clones of Malvasia, some that can be aged for upto 10-20 years but most of the Malvasia varieties were pretty much the table wines of the past (and current) era. Apart from this, Lazio is also a mass producer of easy drinking cheaper styles of ‘Trebbiano’. But a quiet wine revolution has been taking place over the last few decades. With investors now moving further south as prices of Tuscany go through the roof, the combination of volcanic and clay soils of Lazio have found a new home for wine passionists. And to keep updated with the new generation of trendy wine consumers, international varieties are getting planted now. And so, modern styles of dry, fruity and lean wines are very much part of the modern Central Italy offering. Much more cost effective and increasingly as competitive in quality as the neighbouring wines of Tuscany. The boutique wineries here are not many in number and one of the influential and world class producers of this region bordering onto Umbria are the d’Amico Wines (belonging to Paolo and Noemia d’Amico). This is the second home for wine producers of Villa Tirrena, who hosted me for a few days and gave me a chance to explore the region and history of the Central Italian landscape and culture. On a steep hill top town bordering Umbria and Lazio, is the small medieval village of Lubriano, belonging to the Province of Viterbo, where I was hosted by the d’Amicos for a few lovely days of summer, working and experiencing the livelihood in this region and it was an eye-opening experience to learn about this quaint rural village! Lubriano lies on top of an arid clay based volcanic tuffa landscaped hill set amidst the vastness of the Calanchi Valley (meaning Badlands). Calanchi Valley, also known as the Grand Canyons of Italy, is a unique morphological creation comprising of volcanic tuffa escarpments with steep ridges and undulating furrows that have been formed over millions of years through accelerated erosion of the clay soil sediments in the sub soils, which occurred as a result of combination of natural tectonic movements, criss cross moving patterns of natural water networks cutting through the top soil, further perpetrated by centuries of human inhabitation and intervention through acts of deforestation and construction. In this small village of barely a thousand inhabitants who have lived through generations, everyone knows the other through decades of ancestoral interactions! The palazzo and the pharmacy (‘farmacy’) shop at the village are just some of the spots where neighbours catch up during their evening chores. The modest pace of daily activities go hand in hand with the rustic Italian life style where time and the Etruscan and Roman blend of architectural charm seems to have come to a halt. The freshly baked hot baguettes from the one bakery in town opens sharp at 8 am along with the imposing 11th century church of San Giovanni Battista and its bell tower (that chimes every hour reminding one of the forgone era) are a staunch reminder of how simple and meaningful, life had been then and can be now if we allow ourselves to pause and reminisce. The air here is mightily calm even when summer temperatures shoot upto a blazing 43 degrees celsius in July! This was quite the picturesque rural Italian cultural treat that I am grateful to have experienced! Something that is hard to rival outside Lubriano! Despite the rugged and arid landscape, in terms of accessibility this is a village that is suprisingly easy to reach. Nearly equidistant from Florence and Rome, it is located right in the middle of these cities (roughly 90 minutes drive from each city), the sun-drenched road trip is one of its kind. In summers, the red- brown colour of the soils merges with the sun rays making this region typical to what it is - the true mediterranean mosaic landscape. There is only one “high street” in the village which is a cobbled stone pathway narrow enough just for a car to pass by. But what is interesting is that as this street road called Via Roma (don’t ask me why, probably because all roads lead to Rome!) reaches the edge of the hill, it suddenly branches off into a walkway that protrudes out into the plunging deep gorge of the Calanchi Valley, thereafter meandering for another 5-6 km around the base of the valley covering farmlands, couple of demarcated homes which seemed uninhabited, a few recently acquired and modernised vineyards and preserved spring water pumping stations (which was under Lubriano's monopoly during the medieval periods). We were pretty much the only souls walking down the hill that seemed to lead to nowhere but everywhere! The road then went back up the hill back into Lubriano Palazzo, where signs of life once again began and it was indeed fascinating to note how deep down we had gone into the rugged lowlands, as we turned back to get one last stunning view of the valley and Civita di Bagnio regio (next on) from the top, before the Sun went down behind the hills. The Calanchi valley apparently was the original route forming part of the original trail from Rome to Tuscany, taken by pilgrims during the Etruscan times. Another important attraction that should draw you to the village is the gastronomic hospitality that is ever so welcoming. The restaurants, even the local ones such as Il Vecchio Mulino serve truly outstanding central Italian cuisine with fabulous Tuscan, Lazio and Umbrian wines which are not to be missed. As vegetarians, we were warmly taken care of, keeping our dietary needs in mind. The international gastronomica ristorante and enotica in Baschi, “Sala della Comitissa” started by Maurizio Filippo, Italy's best sommelier of 2016, is an impressive restaurant about twenty minutes drive out of Lubriano, aiming for a Michelin star and bringing out the the best of European cuisine prepared tastefully by the Chef Edi Dottori (who has been recently added to Guida's Charming Chefs of Italy for 2017) and her team as they lead the way for Umbria to become a promising gastronomic destination in Europe. South of Lubriano is the capital of Etruscans, a dying and collapsing medieval fortress city perched atop the hills of Calanchi Valley called Civita di Bagnoregio (called Dying Town). A city constructed around the 8th century BC on a not-so-strong foundation of red clay sub soil under the soft volcanic tuffa volcanic soils, has forever been a shifting landscape. Erosion over the years has seen many parts and facades of this fortress hill crumble away into the numerous streams flowing under it, the Chiaro and Torbido being the main rivers that finally merge into Tiber to the north. The pathway leading to the City has already been eroded and has been replaced by a one kilometre pedestrian bridge built, that can only be crossed by walking. Cars are not allowed in this city and the only way to transport goods are licensed motorbikes that also take rubbish in and out of the fort. There are also remnants of caves leading into the Etruscan Necropolis that have now been shut down for public. In the 8 century BC, it was believed to be a bustling city which gradually got neglected under the Roman rule but the Civita (pronounced as ch-i-vi-ta) still remains as a preserved entity. Sadly, it is under the threat of a full-fledged implosion and large scale ruin at any moment so visiting it now will be the best time! The Piazza has the San Donato Church around which numerous gastronomic restaurants such as Alma Civita have popped up to serve hungry tourists who have made their way walking in the hot sun. With a population of no more than 300 in summers and about 50 in winters, the majority of the main inhabitants are above the age of 60 on what remains of this beautiful Dying Town. To the east of Civita di Bagnoregio, along the border of Lazio and Umbria, facing the phenomenal Calanchi Valley are the fascinating, neoteric vineyards of Paolo and Noemia d’Amico. The exquisite relais constructed about 30 years ago was born out of their passion for wines and love for art, the place they chose for their dreams to come true. Paolo hails from an established shipping family in Rome while Noemia, a designer by profession is Brazilian, of Portuguese origin. D’Amico winery is their very own first generation vineyard and wine creation which they started in 1985. One of the remarkable attractions is the spectacular botanical garden with phenomenal views of the Italian Grand Canyons and the Civita di Bagnoregio, where the sun plays it colourful tunes reflecting the colours of the valley at different times of the day. The garden is decorated with exclusive sculpture and artefacts selected and curated by Noemia herself, all of which she has sourced using her international art network. Works include those by renowned artists such as the Meshman, David Begbie; Greek Italian artist Jannis Kounellis; Italian Sculptor Benedetto Pietromarchi; Italian expressionist Bruno Cassinari ; London born artist, Yuki Aruga; Bombay born artist Anish Kapoor and Mark Shand, brother of Duchess of Cornwall. The tour then takes you to the stunning 6 double bedroom luxury relais which has been refurbished over the last few years where Noemia has added her artistic flair with ornate furniture and interior designs from a range of countries such as China, India, Thai, English heritage to eclectic Scandinavian expressions. The entire villa along with the 12th century Tower, Terra Del Sole is available for rent for special occasions such as weddings as well. The magnificent sun soaked vista of the Grand Canyons contrast beautifully with the lush green manicured gardens where Noemia has replicated her childhood life spent in her home in Brazil through cooling creations such as water fountains and sheltered arches lined with lemon trees, olive, jasmin and rose bushes on either sides. On one side, the garden gives way to the deep valley and the other side opens into the huge expanse of their vineyards, the ones at the entrance of Villa Tirrena, being Chardonnay. The soils here are particularly volcanic extension of tufa of the valley mixed with calcareous soils. These provide well drained soils that allow roots of the vines to dig deep down for pulling necessary nutrients. The 16th century wine cellar that runs below the entire span of the botanical gardens was bought in 1985 and has been refurbished and extended over two phases, one around the early 1990s and the other around 2007. Vineyards were also planted around the same time and their first vintage was produced in 1995. Since then there has been no looking back for the family! Once you go underground, the cool air of the tufa wine cellar surrounds you with a welcoming bliss. A modern winery that has been designed by d’Amicos in conjunction with the renowned architect Luca Brasini, the entire cellar springs to life with classical opera music that is played softly in the background. Just like art, music forms an integral part of the d’Amicos’ belief that opera symphony and vocals resonate with wines while they rest in their barrels and the vibrations influence the wines to capture enchanting grace and maturity. As you walk along the long pathway with calming surround sound system, the cellar opens up into a monumental wine library. One the other side is a softly lit up cozy tasting room set up with a long elegantly dressed table. The wine tasting at the relais is quite a unique experience as it brings out the rustic character of the region along with a charming contemporary wine making style. With over 30 years of vine growing excellence, the wines are being worked on a progressive path gaining concentration as they age and adding in the best of the climatic and soil offerings that run from the ancient times. First to be planted here in 1985 were the Chardonnay which is now used to produce more than one style to suit differing seasons, moods and gastronomic palates. Guillome Gelly the head winemaker and also in charge of vineyards is from Alsace and aims to add a cool terroir touch to the wine making process. With annual production of around 150,000 cases, most of the wines are aimed at export to the UK, Singapore, Brazil, Norway, Holland and US that has been up year on year. Picked from their DOC vineyards in umbria, the name Noe pays homage to Noemia from where it gets its name. Straw coloured wine, it has aromas of citrus lemon and white pear and apple blossom. Zingy and sappy, it is great as aperitif and also pairs easily with fish, white meat and lunch salads. A wine to be meant for daily consumption expressing refreshing and easy drinking style that it is meant to convey leaving behind lots of lemon acidity at the finish. They used to produce Orvieto Classico but have cut down on it since Chardonnay yield is being highly controlled and they want to save it for the Falesia and Calanchi single varietal wines. A blend of 70% Semillon and 30% Sauvigon Blanc, Ala name has been taken from their daughter. 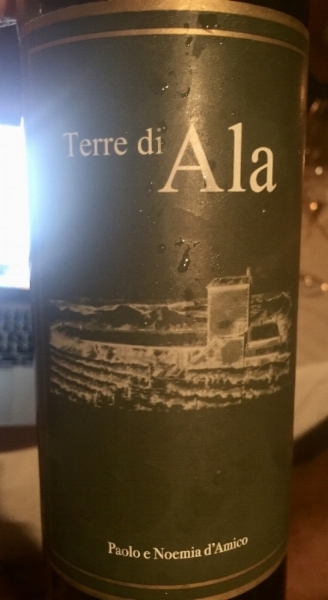 A grape that can get flabby in the heat of Umbrian summers, Guillome has done a brilliant job at keeping the wines at very balanced levels with sauvignon blanc still retaining some of the green blossoms and vegetal notes while Semillon adding a good underlying structure. These are picked from the 2.5 ha of Chardonnay that were planted at the entrance of d’Aamico vineyard in 1985 at 450 m above sea level. Now coming of age, these mature vines still remain in good condition. From this batch, there are two styles of wines produced – Falesia and Calanchi. This range was started in 2003. First few years were a tough vintage for the Merlot to take hold of the soil and initially wines produced were a bit overly aggressive on tannins. Over the years, Syrah has been added in gradually increasing amounts from a small hectarage that is grown around 450m above sea levels to bring an increasing level of ripe smoothness. Merlot is also harvested in different lots at varying levels of ripeness depending on the altitude at which they are located to give a good balance to the blend. As per the team, the hail that hit the vineyards in July 2017 possibly could affect 20% of the vintage of the year especially of Chardonnay for the Falesia, but efforts are on to save as much as possible. Pinot Noir and Merlot ripened well this year and were saved from the worst of the frost and are expected to be a bigger produce. All in all, a memorable and enchanting world where wine, art, culture and history come together to create a sensual harmony, Villa Tirrena and d'Amico wines will surely set your palate to exploring the new generation of 'Super Lazios' while invigorating the sensory, intellectual, historical and artistic sides of your personality!